Take a peek at this page sample. 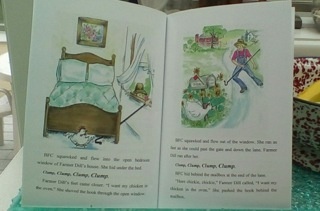 BFC squawked and flew into the open bedroom window of Farmer Dill's house. She hid under the bed. Clump, clump, clump, Clump. Farmer Dill's feet came closer. "I want my chicken in the oven." She shoved the hook through the open window. BFC squawked and flew out of the window. She ran as fast as she could past the gate and down the lane. 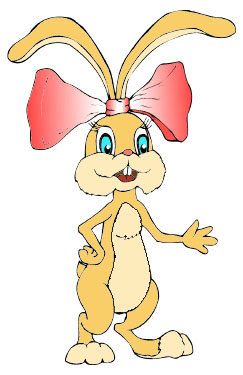 Hunny Bunny Welcomes you to our preschool library. She loves to hear stories, and hopes to read these books when she is a bit older. No matter what age children, or no matter how many students you may have, plan to read to them at least once a day. After reading ask them what they thought about the story. This will impress the love of books in their minds forever. FILL UP YOUR BOOK SHELVES WITH GOOD BOOKS FROM OUR LIBRARY! Every class room should have BOOKS, BOOKS, and more BOOKS. 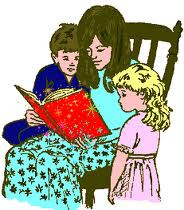 The books should be brightly illustrated with color and simple pictures. There are millions of choices and we each have our favorite books we like to read to our students. 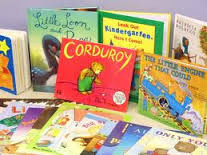 As a preschool teacher I always looked for picture books that hold students' attention. I find that both the story and the illustration are important to making a book a child will want to hear over and over again. When I see a particular book that I would add to my classroom reading center I will leave it here. My rule of thumb for a book I keep in my classroom is: If it keeps the students attention (they show this by sitting still, and looking wide eyed at the illustrations,) and by asking to hear it over again. ** books: Their authors have been interviewed above. A baby bird has hatched while its mother was away. Fallen from his nest, he sets out to find her and asks everyone he meets, "Are you my mother?" Children adore the little bird and are thrilled with the happy ending. Owl has fallen out of his perch. He is hurt and cannot fly so he seeks refuge in other animals homes. Each animal is leery of this owl but eventually allows him to come in and shares their meal. kindness goes a long way and gratitude is key to happiness. It's Valentine's Day, and Little Critter's class is celebrating! They're decorating the classroom with hearts, eating cupcakes, and making Valentine's Day mailboxes. Little Critter is making an extra special card for an extra special valentine. Who will it be? Cute and charming bug characters and help students to look at these buggy nature objects without fear and to treat them with respect and kindness. It's summer in the city, and a rascally squirrel is up to all sorts of tricks. But when he sneaks inside an apartment window, he'll need one nutty solution to get back out! Labels identify plants, birds, and insects on each page, and a glossary at the back of the book offers factual details about squirrels. A rhyming tale. Follow Mama Grizzly Bear thru the seasons. Teachers are provided with additional references and resources to further explore the world of grizzly bears. Can you imagine being able to choose your pants for the day, based on how you feel? That is just what Peter T. Peacock has decided to do. A fun way to learn about colors AND emotions. Teaches shapes, colors, counting, and holidays. There's an activity page too. Below I share books and their authors who I know have a child's interest at heart and whose talent and hard work has brought alive a book I would read in my classroom with pleasure. Please support these authors by buying their books and leaving a review at the site where you purchased it. Making fun of someone is never a nice thing to do, especially when you don’t know what they might become in the future. Find out what happens to Jefferson that surprised all his friends. Self esteem begins at a very young age with love and hugs from parents and family. Positive attention from teachers builds on the students feelings of worth. This book teaches children how to treat others, but also in a way teaches them to like themselves even when they are teased by other children. 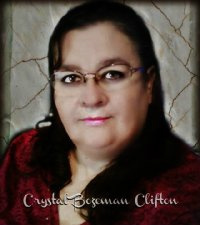 Author Crystal CLifton is married and has four children and six grand children and her Childrens Books are loosely based on them. She was raised in Dalhart, Texas where she still calls home. She currently resides in Michigan. Writing has always been a passion of Crystals. She has been writing since she was about eleven years old. Crystal, Thank you, for agreeing to this interview. 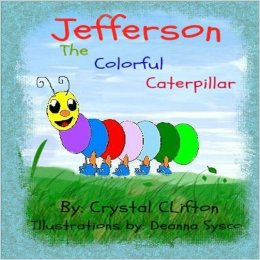 Where did the idea for ''Jefferson the Colorful Caterpillar, come from? My oldest son was made fun of because his hair was different once when he was in elementary school back in 1996 and came home so upset and I for some reason sat down then and wrote this story from that happening because I knew he would change one day and they would be so surprised and he did. What convinced you to write Jefferson the Colorful Caterpillar? I knew kids needed to be shown that making fun of someone for being different in so many ways was not nice and they should never tease or bully. I was just so hurt when my son came home that day . Please tell us about yourself as a writer. when do you write, where do you write, what gives you inspiration to write? I pretty much write in spurts when I get an idea or a memory. My books are usually loosely based on my kids childhood. I write wherever I am sitting at the moment I come up with it. My kids and grandkids give me all the inspiration I could need. Do you have other preschool picture books in the works for future publication? I have one releasing in April and I have a series based on my Grand daughter that I am working on but that will be a while in coming. We are looking forward to reading your next book. Thank you for sharing this book with our teachers. Welcome to Ms-Marge's Cyber preschool class room, Margot. Coming from Australia, I knew that Down Under critters would have kid appeal, and that bears, prairie dogs, bald eagles, platypus, kangaroos, and koalas would fit my “kid friendly” needs perfectly. I wanted to write something for young kids that was fun as well as educational. Thanks you for sharing this book with our teachers. You certainly brought both entertainment and education to the readers of your book. 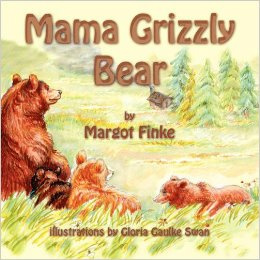 'Mama Grizzly Bear' will fit in with any classroom's nature center. Different shapes make up objects that relate to each holiday but it doesn't have to be a holiday to shape up into a great day. Teaches shapes, colors, counting, and holidays. There's an activity page too. There are many ways of teaching shapes. 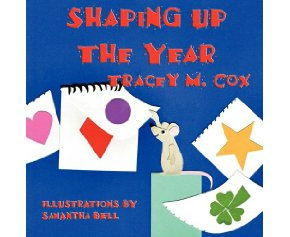 I found this shape book by Tracey M. Cox to be a valuable tool. Samantha Bell's illustrations will keep the students interest. 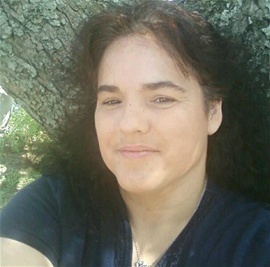 Tracey M. Cox lives in South Georgia with her husband, and three children. She has been writing professionally for over 10 years. Her journey as a writer began once upon a time, in a land far from where she lives now. In that far away land there was magic, the magic of listening to stories and in telling them. "Mom," he said. "THAT would make a great book." Since that long ago night, Tracey has had many articles published in local newspapers, magazines, and ezines. 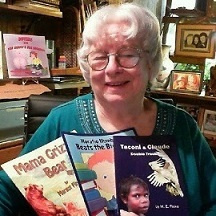 She is also the author of several picture books and has many more manuscripts under contract. Thank you, Tracey for agreeing to this interview. Where did the idea come from for 'Shaping Up the Year'? I was taking an online class and one of the lessons was to take something everyday and incorporate how we use it to symbolize other things. It gave examples and shapes stuck out to me. I got to thinking how shapes make up everyday object and how we used shapes for holidays. For example, a green triangle with a brown rectangle is a tree that we use as a symbol for Christmas. A red heart makes us think of Valentines Day. What convinced you to write 'Shaping Up the Year'? I did some research for preschoolers for shapes associated with holidays. There was little to none out there. So I decided to write it for the year and include the holidays we think about and the ones we don't think about as much. Do you have other preschool picture books in the works? Oh yes, I have an assortment of manuscripts that are in various stages. One that has a special place in my heart is how a little boy handles his big brother being away for so long at basic training. My second son is a Combat Engineer for the Army. Thank you for sharing your talent with the world and especially with our students. Squirrel knows that New Year's Day is a great day for making resolutions! But what does it mean to make a resolution? As she makes visits around the forest she learns about New Year's resolutions and helps her friends get started on theirs. If only she can think of a resolution of her very own. 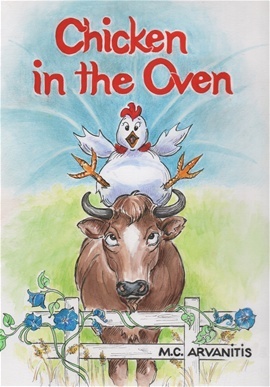 We chose to feature this book because Author, Pat Miller tells a fun story about a hard to find topic in children’s books. Illustrator, Kathi Ember does an excellent job bringing really fun characters to the pages. Pat Miller was born an Air Force brat in Aurora, Colorado. Her first published book, Substitute Groundhog was named a Junior Library Guild selection. 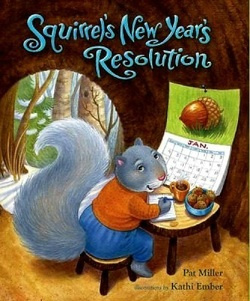 Scholastic reissued that title and Squirrel’s New Year’s Resolution, and We’re Going on a Book Hunt in paperback and audio books for the school market. Pat is a former school librarian, now a Contributing Editor for LibrarySparks Magazine, and has written 20 professional books and 200 articles for school librarians. Welcome, Pat, to Ms Marg'e Cyber Preschool classroom. Where did the idea come from for Squirrel’s New Year’s Resolution? I became quite attached to my animal characters from Substitute Groundhog. The manuscript was rejected 32 times before I got the euphoric phone call from Albert Whitman. So I had really gotten to know the characters through numerous rewrites and plot variations. When I wanted to do a book about making resolutions for the New Year, I turned to those characters. What convinced you to write Squirrel’s New Year’s Resolution? I was an elementary school librarian. One January, my first grade teachers asked if there was a book about making New Year’s resolutions. We had none in our library. I searched area public libraries and publisher catalogs without success. Then it dawned on me that I could write that book. Two years later, I was able to supply my teachers with Squirrel’s New Year’s Resolution in which a rookie squirrel learns about making resolutions from her friends. I have other books that have been a hit in primary grades: 'Substitute Groundhog', 'We’re Going on a Book Hunt', and 'Library Monkeys'. You can find out more about all of my books, and order them, on my web site at www.patmillerbooks.com . Thank you Pat for sharing your charming book. All teachers of 4 - 6 year old students should have this book on their reading list. Thank You so very much Marge seeing my book listed is amazing. Thank you so much for a fun interview!!! Very nice job. I am wearing my "happy pants yellow".